Tens of millions of AK-47 pattern rifles have been made and sold throughout the world. Shooters will benefit from this economy of scale: parts, ammunition, and accessories are widely available. There has been a big hiccup thanks to Obama’s re-election and the latest anti-gun campaigns in the US, but even now you can buy practice ammunition if you look hard enough and are willing to pay higher than normal prices. What’s a little bit harder to find, or justify the price for, is self-defense ammunition. Far fewer companies make self-defense ammo in 7.62x39mm and as one would expect the price per round is much higher. 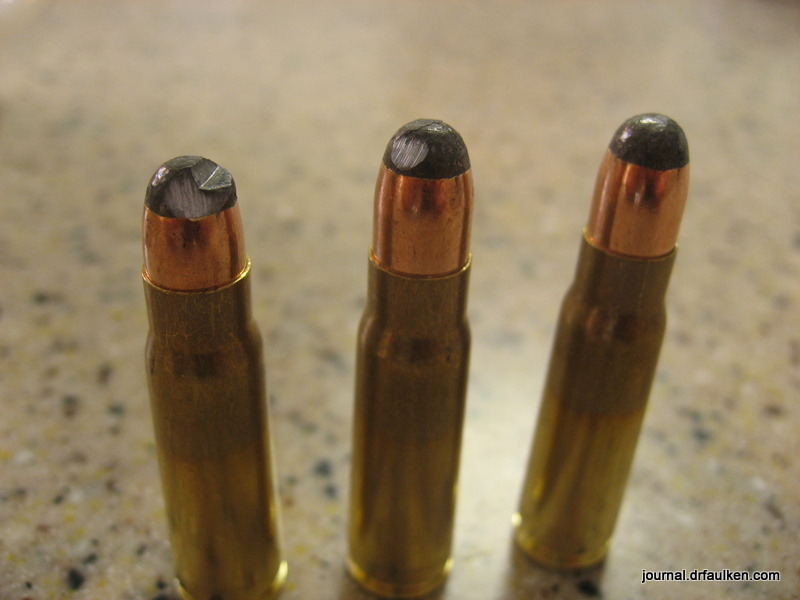 Self-defense ammunition in 7.62x39mm is between three and six times the price of practice ammunition. Considering a standard capacity magazine of 20- to 30-rounds, that’s a lot of $$$ just to stock a single mag. Multiply that by a few magazines plus a few rifles and the cost of ammunition can be greater than the price of a rifle itself. I had read good things about Prvi Partizan’s soft nosed ammunition. 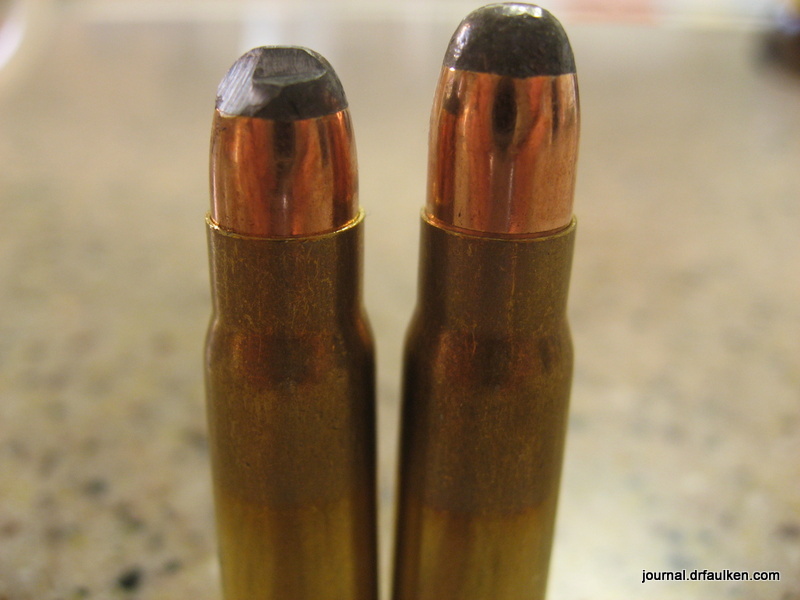 It was a half-way point between surplus full metal jacket ammunition and copper bonded high-performance stuff like Hornady’s SST, V-Max or Cor-Bon. I bought enough ammunition to outfit two rifles thanks to SG Ammo, whom I’ve used multiple times in the past. They were great as always. However, upon test chambering the Prvi Partizan ammunition in my AMD-65 I became concerned about two things: bullet setback and damage to the exposed lead in the nose of the bullet. From left to right: twice-chambered Prvi Partizan, once-chambered, never chambered. The twice-chambered round on the left is significantly shorter than the one on the right. This is called bullet setback and means that the bullet has been pushed into the rest of the cartridge. Shooting a round such as this one can be dangerous, as there will be increased pressure when the round is fired. If the pressure increase is great enough it may cause damage to the firearm or the shooter or both. Has anyone had better success with their Prvi Partizan soft point ammunition in an AK-pattern rifle? 1 Comment on "A Major Setback: Prvi Partizan 7.62x39mm Soft Point Ammunition Problems"
As far as the set back goes, I’m not sure it’s as much of an issue as many make it out to be. They didn’t have any issues. I realize that rifle rounds are much higher pressure than handgun rounds, but it still may not be as big of a deal as we’ve been led to believe. I hope LG (or someone) does set back testing with rifle rounds. The deformation of the lead will certainly have a negative impact on long range accuracy but how much an impact IDK.